Kingston Brass Oil Rubbed Bronze Made to Match Tub Drain Strainer & Grid DTL205: This Tub Drain Strainer & Grid is built to last. The highest quality standards are used to precision manufacturer a top of the line product. Important features of this BRAND NEW Fixture: Complete Item! Everything necessary for installation is included. 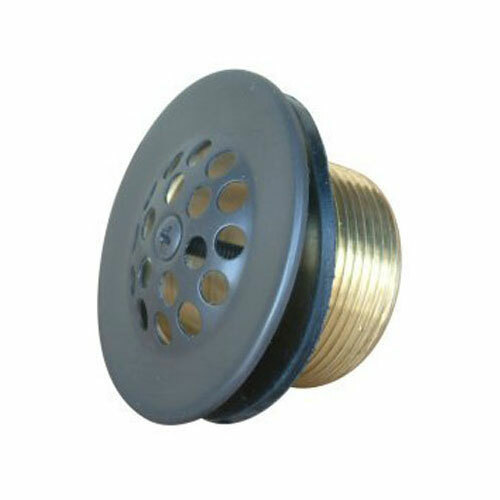 Matching Accessories Available - Easy to Install - Installation instructions included - Tub Drain Strainer & Grid - Coated with solid brass, the 1-1/2-inch strainer drain is compact and layered with multiple drain holes to allow effective drainage to occur after washing or bathing. - Made from oil-rubbed bronze finish - Premium brass construction for durability - Heavy duty construction - Ten-year warranty - 1-1/2-inch diameter tube - Oil Rubbed Bronze premier finish designed to resist fading and tarnishing. This fixture is manufactured by Kingston Brass and is part of their Made To Match collection.